The Niagara Falls Water Board’s Compliance & Inspections Division monitors a federally mandated program imposed on the Niagara Falls Water Board by the U.S. Clean Water Act through the Code of Federal Regulations section 40 CFR 403. The Industrial Pretreatment Program is designed to ensure that the local municipalities, such as the NFWB, perform activities including sewer discharge permitting, sample collection, and inspection and monitoring of all users of the Publicly Owned Treatment Works (with the exception of residential users). The intent of the program is to prevent industrial and commercial users from discharging pollutants to the sewer system that cannot be treated adequately by the NFWB and thereby enter the Niagara River in quantities that are detrimental to aquatic life and/or humans. The program is administered by the U.S. Environmental Protection Agency and, to a lesser extent, the NYS Department of Environmental Conservation. Please contact Joel Paradise at 716.283.9770, x. 261 for more information. 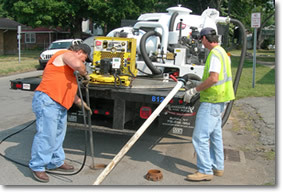 Required by the NYS Plumbing Code and the Niagara County Health Department, the Cross Connections Program allows for the inspection and monitoring of residential AND commercial sewer connections and public drinking water systems. To ensure all sewer connections and discharges are connected to the appropriate type of sewer so that the sanitary waste comes to the NFWB via sanitary or combined sewers. To ensure storm water discharges, such as gutters and sump pumps, are properly connected to storm sewers. As providers of potable water, the Niagara Falls Water Board must ensure that the public drinking water system is protected with devices such as back flow prevention devices, water meters, and check valves. The Cross Connection Program also requires installation and testing of such devices. Please contact Randall Burns at 716.283.9770, x. 240 for more information. Please note that the new fee for a Water and Sewer Compliance Inspection is now $120.00.